This is a 6 page sample of my novel study for James and the Giant Peach by Roald Dahl. This is part of a 125-page novel study, which includes chapter-by-chapter analysis, 31 additional Common Core aligned resources, Culminating Project Choices, and more! It is a well-rounded, no-prep unit that will engage your students and sharpen their reading skills. Download this free sample today. If you like what you see, purchase the complete novel study, so you can use an imaginative book to teach priceless reading skills! 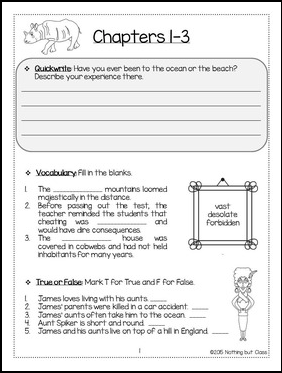 *Quickwrite-Warms up students' brains before the reading. *Vocabulary-Introduces new words in each chapter.